I just set the timer - the 2012 launch goal is April 30, 2012. I'm feeling pretty good about making that date since the boat is mostly ready. She's already uncovered, and everything is in good shape from the winter. At this point I'm in the process of replacing some running rigging. 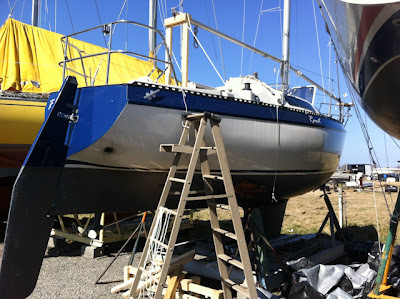 I need to get my sails back from the loft from winter repairs, and I need to recommission the engine. At that point I'm ready. Bring on the early season - I'm not spending any wasted weekends in the cradle this year!